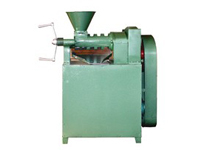 KMEC is an expert in the seed oil processing machinery. We are a highly advanced company that devotes ourselves to development of both small and large oil pressing company .We are located in the new High Technology Industrialization Zone in Henan , China , which is superior in its geographical location and is convenient for the transportation. Our company has built our own R&D center and maintains relationships with many other R&D units and higher institutes. After years of development, we have formed a comprehensive business pattern for project-design, new-product research, machinery manufacturing, installation and debugging, technical training and after-sales service. The following process description discusses is mainly about soybean oil manufacture, because emission factors are available only for that activity. Corn, cottonseed, and peanut oil processing are similar to soybean processing, except for differences in the soybean preparation for oil extraction. The process for soybeans typically consists of five steps: oilseed handling/elevator operations, preparation of soybeans for solvent extraction, solvent extraction and oil desolventizing, flake desolventizing, and oil refining. 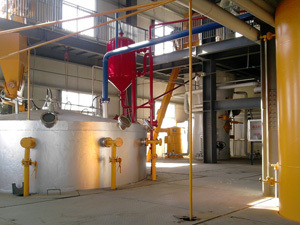 Following a reaction time of several minutes in special retention mixers, the oil is heated and sent directly to the first separator in order to separate the soapstock. 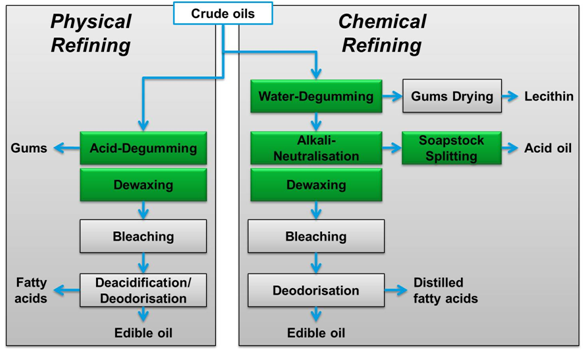 The neutral oil is washed in order to further reduce the residual soap content. For this purpose, approx. 3 – 10% of hot water is added to the oil, mixed in a dynamic mixer and separated into wash water and oil in a separator. The residual humidity of the oil is further reduced in a vacuum drier. You are welcomed to send email to get support from us! We are always ready to serve you!